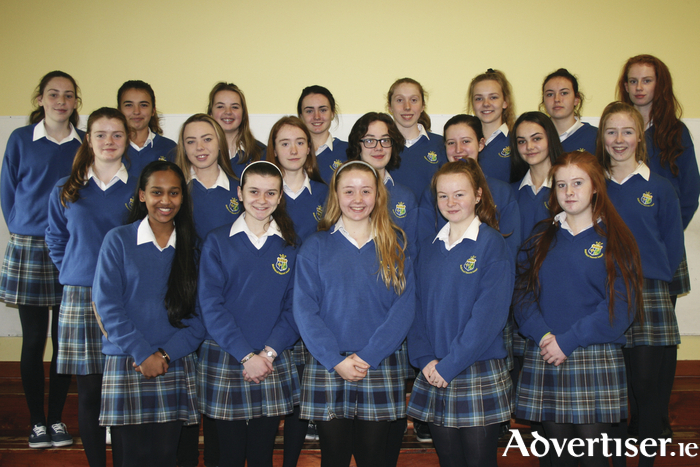 Some of the TY students from St Joseph's, Castlebar, who will be taking to the stage next week in their annual musical. "Oh the thinks you can think"! St Joseph’s transition year students, Castlebar, have been doing more than thinking ‘thinks’ these past few weeks. They have been busy rehearsing and bringing to life all of the favourite Dr Seuss characters including Horton the Elephant, The Cat in the Hat, Gertrude McFuzz, Lazy Mayzie and JoJo and many more wonderful characters in their performance of Seussical The Musical. This show, this magical musical extravaganza, will take you from the Jungle of Nool to the Circus McGurkus and to the invisible world of the Whos. Seussical tells the story of Horton, an elephant, who discovers a speck of dust that is in fact a planet containing a group of small people called the Whos. One of the Whos is a child called JoJo, a thinker with a vivid imagination. Horton befriends JoJo and between them they protect the planet of Whos from a world of naysayers and dangers and also guard an abandoned egg left in Horton’s care by the irresponsible and irrepressible Lazie Mayzie. But through all the tribulations they face, friendship and loyalty and belief in the goodness of people wins the day. This show, Seussical, follows on the successes of previous and recent St Joseph’s shows, including Tale as Old as Time, High School Musical, Thank You for the Music, and Grease. The combined talents of the cast of 89 transition year students bring the whole show together. They are involved on stage, in set design, costume, make–up, promotion, and ticket selling. No job is too big or too small for this dedicated and talented group of students. They are supported and guided by a team of talented and professional teachers and personal. Musical director is Deirdre Lee and the director is Donna Ruane who are ably assisted by choreographer Hazel McGlynn. The school orchestra under the baton of Deirdre Lee is supported by Mick Buckton, Tom Lyons, and Raf Dziubinski. The colourful and extravagant set design is by Eugene Finnegan assisted by Ann Geary and Ruth Flannelly, and costumes are by Aoife Durcan and Niamh Sweeney. School principal Marie Mac Cabe, along with the school community is looking forward to the show which has become an important event in the school calendar. Ms Mac Cabe is very appreciative of the hard work and dedication by both staff and students that has gone into putting the show together. Seussical promises to be a fun show for the whole family. The catchy musical score emerges as a Seussical mix of styles ranges from pop to gospel, rhythm n’blues to funk. So go along, tap your feet, clap your hands, and be mesmerised and enchanted by the wonderful characters from the world of Dr Seuss. The show is on in the Breaffy Arena on Thursday November 17 and Friday November 18 at 8pm. The doors open at 7.30pm. Tickets are available from the school at (094 ) 9021406 or at the door on the night of the show.